The quality of assets in the banking sector may improve in 2019, show stress tests conducted by the Reserve Bank of India (RBI). Under the baseline scenario, the gross non-performing assets ratio (GNPA) ratio of all banks may come down from 10.8 per cent in September 2018 to 10.3 per cent by March 2019. This could further fall to 10.2 per cent in September, said the RBI’s Financial Stability Report, released on Monday. “After a prolonged period of stress, the banking sector appears to be on course to recovery as the load of impaired assets recedes; the first half-yearly decline in the gross NPA ratio since September 2015 and improving provision coverage ratio, being positive signals,” said RBI Governor Shaktikanta Das in the report. He said the stress test results suggested further improvement in the NPA ratio though its current level remained still high. The asset quality of public sector banks(PSBs), which have the highest concentration of non performing assets, at 14.8 per cent in September 2018, may also see an improvement. PSBs’ GNPA ratio may decline to 14.6 per cent by March 2019 under baseline scenario, whereas private banks’ GNPA ratio may decline from 3.8 per cent to 3.3 per cent in March 2019. The GNPA ratio of foreign banks under baseline scenario might also decline from 3.6 per cent to 3.1 per cent in March 2019. Under the assumed baseline macro scenario, system level capital adequacy ratio (CRAR) is projected to come down to 12.9 per cent in March 2019 from 13.4 in September 2018. Further deterioration of CRAR to 12.1 per cent is projected under severe stress scenario, according to the central bank. 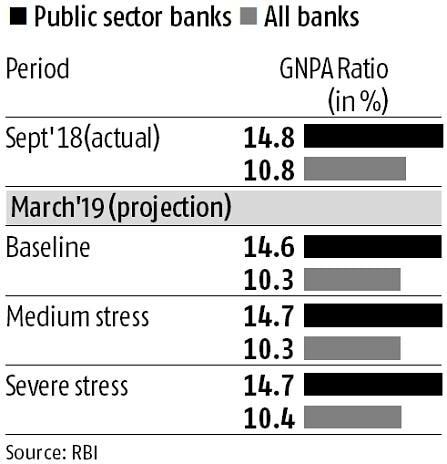 If the GNPA ratio in the banking system increases by four percentage points, the system-level CRAR will decline to 11.1 cent while Tier-1 CRAR will decline from 11.2 per cent to 9 per cent. Stress hit of this magnitude will mean that 18 banks, having a share of 31.7 per cent of the banking systems’ total assets might fail to maintain the required CRAR. PSBs were found to be severely impacted with the CRAR of 16 of the 21 PSBs likely to go down below 9 per cent in case of such a shock, said RBI. Stress test on bank’s concentration risk showed that if top three individual borrowers according to their stressed advances fail to meet their revised payment commitments, the impact was significant for 14 banks. The same scenario with top three individual borrowers according to their exposures would severely impact 12 banks. Stress tests on group borrowers reveal that as many as 14 banks will not be able to maintain their CRAR level at nine per cent if top three group borrowers fail to meet their payment commitments, said RBI’s report. The losses could be around 7.6 per cent and 13.6 per cent of the capital at the system level under the assumed scenarios of default by the top group borrower and by the top two group borrowers respectively. A sector wise stress test revealed that telecom will register the highest growth in NPA followed by cement sector, said the RBI’s stress test.